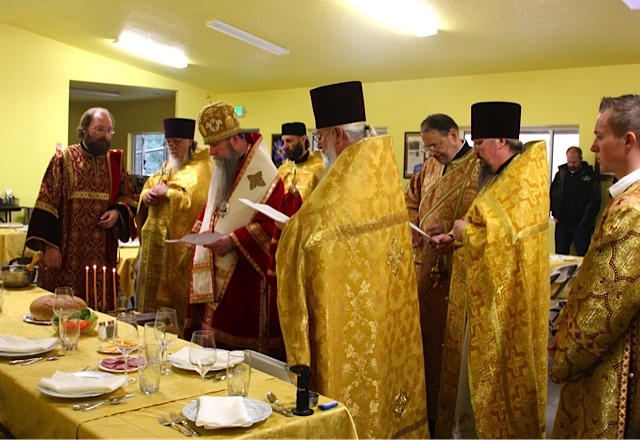 St. Martin the Merciful Orthodox Church in Corvallis, Oregon, formally dedicated its new parish hall on February 6th and 7th, 2015. It was a festive occasion, with clergy and laity from a number of jurisdictions joining with parish faithful to celebrate the realization of a long-held goal. Construction of the hall was a two-year project, with many donations of assistance from Orthodox contractors and the work of community volunteers in construction. The hall measures 28 x 64 feet, on two levels. The upper level provides assembly and classroom space, and a kitchen, and is fully equipped with modern media amenities, including a ‘live feed’ from the church for the convenience of those working in the hall or tending children during services. The lower level is designed to be finished as a rectory at a future date. 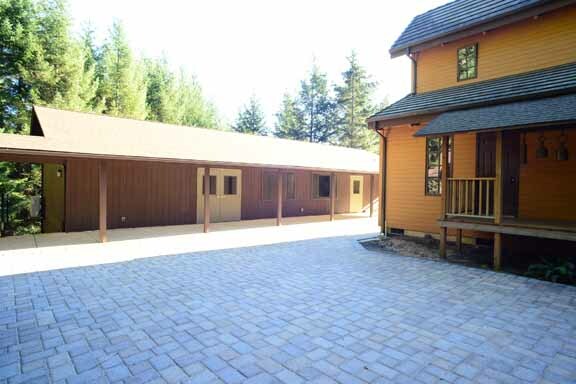 The hall construction was also the subject of the inaugural diocesan Youth Project in June, 2014, which added a beautiful paved courtyard and walkway between the temple and hall. 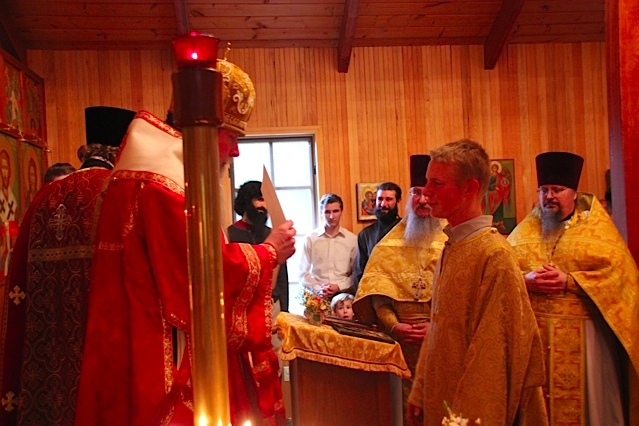 Archbishop Kyrill of San Francisco presided at services, joined by visiting Archpriest Alexis Kotar (Seattle), Archpriest David Moser (Boise), Priest Daniel MacKay (SOC, Eugene), Hierodeacon Peter (Karazoff), and Deacon Stephen Dyer (SOC, Eugene). 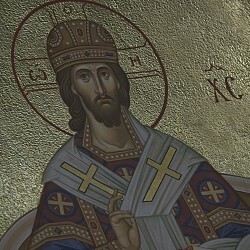 The services were chanted in English and Slavonic by the parish choir under the direction of Subdeacon Martinian Prince. At the Small Entrance at the Liturgy, the parish rector, Fr. 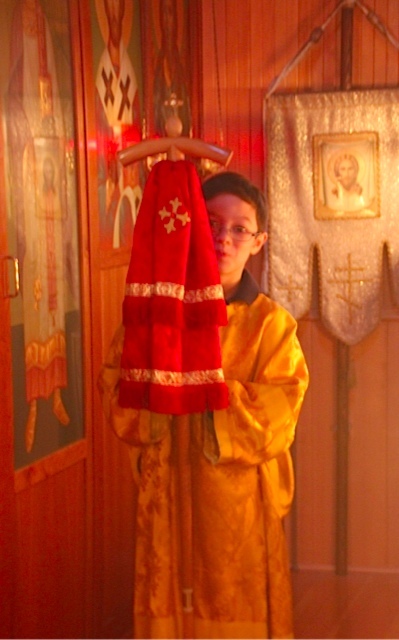 James Baglien, was elevated to the dignity of Archpriest. At the conclusion of the Liturgy, a number of awards were made to parishioners for their efforts in raising the hall. The lead donors for the project, Drs. Michelle & Brian Curtis, were awarded the Order of St. John of San Francisco, Third Class in recognition of their support. 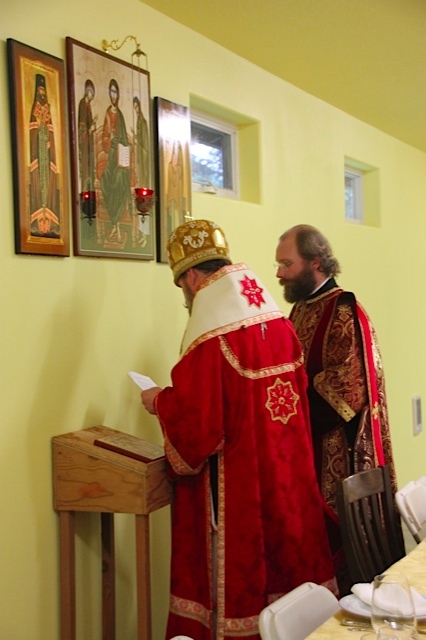 After presentation of awards, all moved on to the Hall, where Vladyka Kyrill blessed the new building. A festive trapeza followed, prepared by the parish sisterhood. With its new hall in place, the parish will host the 2015 St. Herman West Youth Conference in December.